Comments: Still cute, with some environmentally concerned messages buried underneath the kitty ears. In Tokyo Mew Mew, five girls have been infused with traits of five different endangered species, with each creature lending a girl special powers. Unbeknownst to most of mankind (but knownst to the girls), there's an invasion occurring right underneath humanity's nose, and only the girls can stop it. These invaders possess animals and use them against people, and both the people attacked as well as the creatures being manipulated come to harm during the possession. In this volume, the girls finally discover their fifth member. Also, a surprise attack in front of a live news feed garners newfound attention to the super powered freedom fighters. Suddenly, the girls are famous, but whether their increased public status will help or hinder them remains unclear. When I read this series, I take it exactly for what it appears to be - cute, entertaining, brain candy. The cover is so energetic and pink that it's hard not to judge this series right away as childish tripe. True, more complex plot permutations are dismissed over obvious paths, but this is an engrossing title, if not if not the most intellectual. For example, when the fifth member of the team is discovered, I was wondering if perhaps she would join the enemy at first, creating a little bit of strife for the characters. Instead, the plot has progressed like clockwork, and while I appreciate something that works as it should, it's nice to be caught off guard sometimes, as well. Really, the series is written very self-consciously, for Ichigo frequently makes comments (under her breath, of course) that certain lines sound corny, or clich‚. It's odd, but so long as the authors admit that they're being a little silly sometimes, I don't mind it. There are no delusions of grandeur here, and the honesty of just presenting an endearing action-romance story is nice. 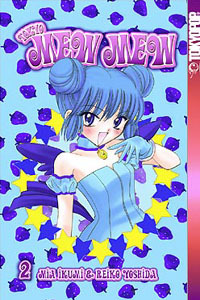 One of the most attractive aspects of Tokyo Mew Mew is easily Mia Ikumi's ultra-cute artwork. Big eyes, cat ears, fuzzy tails, and short skirts all come together in a cuteness combo that's hard to resist. I even get a kick out of reading Ikumi's notes as she exclaims how much she loves cosplay, exhibiting her fondness for anime- and manga-inspired fashion. Her enthusiasm shows clearly in her energetic illustrations. The focus in this series is clearly on the characters and their costumes, both of which are as attractive as anything you'd find in Di Gi Charat. Just as in the first volume, this one has plenty of extra material at the end of the book, from author notes to fact sheets on the endangered species mentioned in Tokyo Mew Mew. I'd really like to see a profile on the production team, for they seem like interesting people and it would probably make for good reading after finishing up their latest book. However, TOKYOPOP has done a good job so far with these first two releases, so I'm expecting more extras in the books to come. For now I can't complain. There weren't many noticeable typographical errors, and the writing flows along well. I really love the book's format - it's big enough to see everything, but small enough to read with one hand while I eat lunch with the other. This is an important feature since I do a lot of reading on my breaks. Additionally, since it reads from right to left, I can put it in my left hand while I do complex acts with my right, such as juggling. Don't ask me why I juggle on my lunch break while I read manga. I just do. Well, that's about it for this particular review. As I said before, this is a series that is exactly what it looks like. Tokyo Mew Mew is a shoe-in for young girls, but it's funny enough that anyone else should be able to appreciate it. With a TV series that's bound to be here soon, this is probably going to be one of the most popular releases this year. It's cute, pink, and full of young girls fighting evil while sporting kitty ears and skirts. If only real life was this much fun?